> The glass bowl is made from molded glass. This makes the bowl resistant against temperature fluctuations. > Precisely machined thread-mounts guarantee a convenient and even fun assembly of the individual components. > The spigots are screw-mounted. They can be easily removed and cleaned by using a pipe cleaner. > The Classic Absinthe Fountain's base is cushioned with a foam pad. This prevents slippage and ugly scratches on your table. > All of the fountain parts are polished and therefore shine bright like the Belle Epoque itself! > The fountain is made out of food-grade nickel-plated brass, certified by the Fresenius institute. 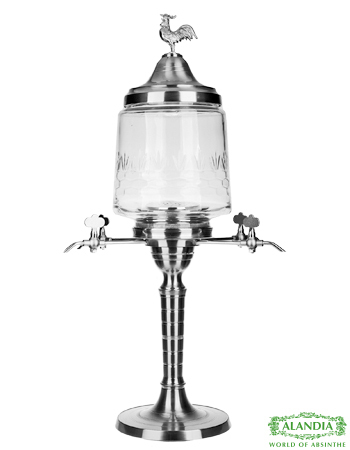 The reference model for the Classic Absinthe Fountain was the legendary Terminus Fountain. Terminus was a famous absinthe manufacturer during the 19th century. The distillery was located in France and therefore it doesn't surpirse that a rooster was chosen to decorate the lid. The rooster is the French national symbol. The classic Absinthe fountain has as well this rooster as a decorating element. It shall express that the Absinthe culture is deeply rooted in the French Republic. Besides this obvious decorative element some smaller designing details are worth of mentioning: All spigots are engraved with a Triple A logo. The letters stand for the project name "Authentic Absinthe Accessories" but also intend to evoke associations of quality: Because "Triple A" as a rating communicates in in the finance market "simply the best"! How do you drink Absinthe with a fountain? Where can I buy a classic absinthe fountain? ALANDIA sells it. They ship worldwide, including the USA. All fountains are packaged in a protective styrofoam box. These boxes are then packed again in a heavy duty shipping box. You can be sure, your fountain will arrive sound and safe! ALANDIA offers a 100% Delivery Guarantee, covering anything that might happen (e.g. lost package or although it never happens "breakage"). And just as a side note, ALANDIA was founded in 2001, therefore they have experience and know what they are doing! If you need further info about how to buy Absinthe in the USA just visit our info site.